The right piece of furniture can make or break the look and feel of a room. Especially when you are dealing with bedroom furniture; headboards in particular. It is often difficult to find the piece that both fits your individual taste and fits into the scheme of the room seamlessly. It is possible for you to create your own exclusive headboard that fits your individual taste and style. Check out these 19 inspired diy headboards that you can build in just one day to spruce up your sleeping quarters. Soft, sleek, and stylish, this diy headboard will do the room justice. Created from plywood, batting, your choice of material background, and an assortment of interesting and contrasting bric-a-brac, this headboard is easy to create. A tiny bedroom doesn't mean you have to live with a small headboard. 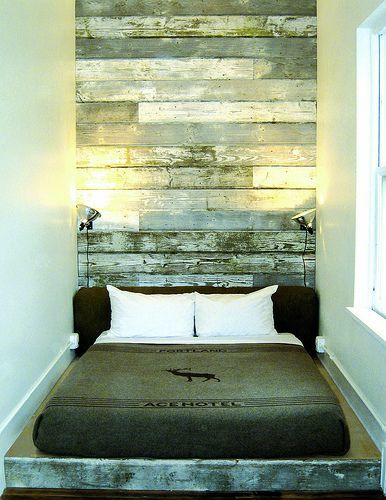 This space utilizes the entire wall with re-purposed wood boards to fill the space and create an incredibly dramatic effect. 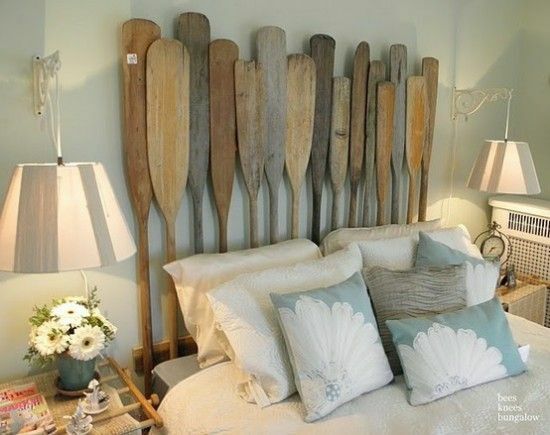 Bring your true passion into the bedroom by incorporating an unexpected element such as these boat oars. This collection of paddles is artfully arranged to create a headboard that is unique and representative of your nautical taste. Living in the big city is exciting and fast paced. The city offers beautiful scenes of skylines and industrial backdrops. 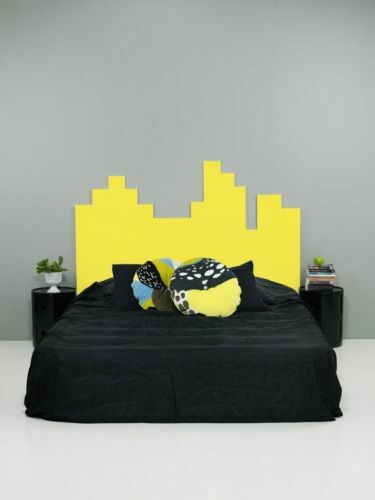 Create your own city skyline headboard with a piece of plywood and bright colored paint. 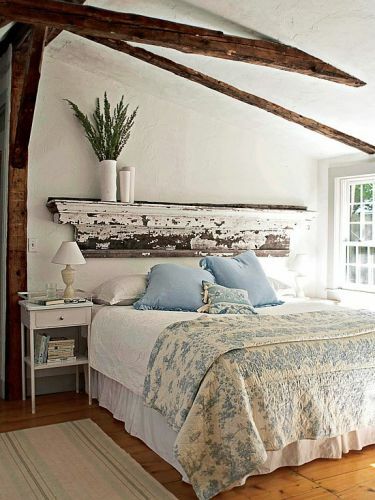 Heat up your bedroom by repurposing an old fireplace mantle into a vintage headboard for your bed. 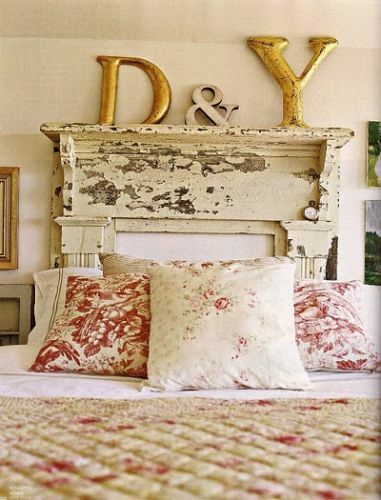 Dramatic and bold, the oversized letters add visual interest and lend to the immense size of this headboard. The bedroom is the place for love, so why not bring your family in to the room? Black and white photos hung on a semi-flexible length of wire creates a clean look and homey feel to the room with a clean design. 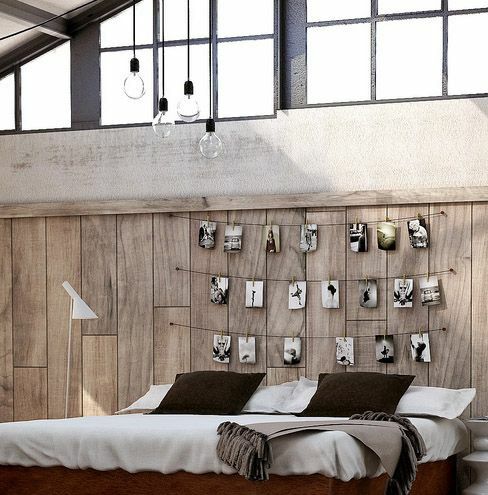 Simple, beautiful, and functional, nothing could be easier than this creative headboard. 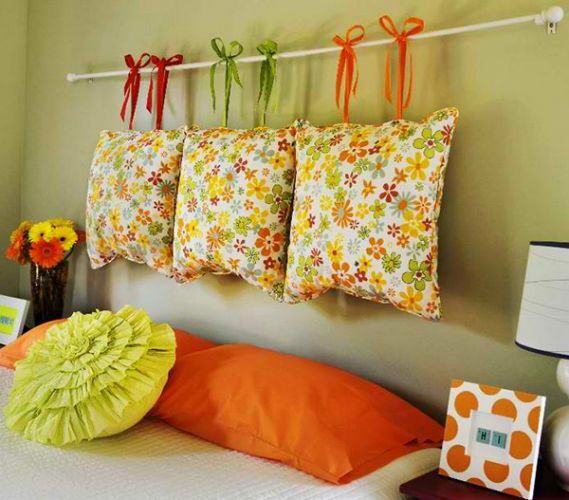 A simple dowel hung on the wall will feature your favorite hand-made blanket or quilt. Multi-functional, the blanket can be used on those particularly cold evenings. 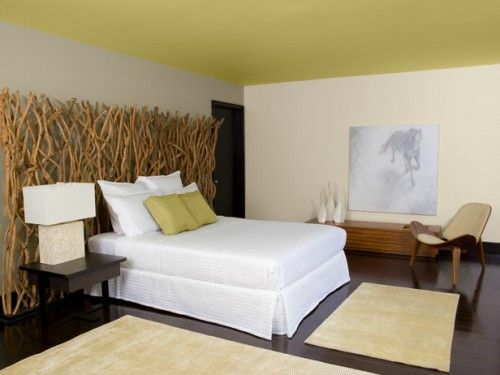 Create an interesting and attractive headboard using stripped branches to complete a twisted wall of visual interest. Cutting the branches the same length gives some rigidity against the wild nature of the twisting and bending branches. Give your bedroom a cabin feel when you incorporate a pre-used fireplace mantle for your headboard. The distressed look of the wood lends to the antique feel of the room. The mantle shelf allows for the display of photos or focal accessory pieces for added interest. Create a headboard full of color with an arrangement of multi-shades of the same color. This simple assembly of canvas on wood frames allows you to choose the color and pattern that fits your personality the best. 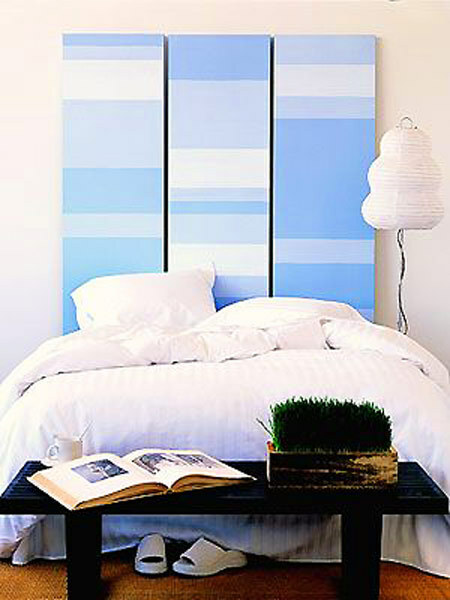 Paint these panels in various sizes of strips to create a random patterned monochromatic piece. Bring some "old country" into the room with these repurposed wooden window frames. Patterned fabrics of accompanying colors are artfully displayed in the frames and bring out the subtle colors in the room. Select patterns that are appealing to you and match the color scheme of your choice. The results are beautiful and cost friendly. A few pieces of molding, some neutral paint, and a painted wreath is all that it takes to make this dramatic bed background. The wreath and wall color can be changed to create a new look at any time, allowing you to change the feel and mood of the room with the changing seasons or whenever the feeling hits you. This simplistic style headboard diy idea cleverly creates a strong focal point with a simple natural element that you may be able to find in your own backyard. This headboard creates an incredible dramatic luminous glow in the bedroom at night. 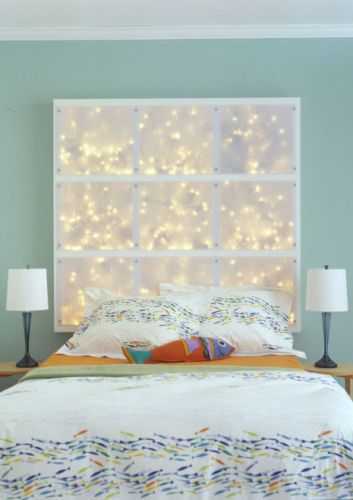 This square headboard with white lights enclosed in frosted panels gives the room a romantic soft glow. Creating individual boxes and covering them with a frosted plexiglass and then installing lights into the boxes creates a relaxing and somber glow in the room. Inexpensive and easy to make, this headboard makes a soft impression in a big way. 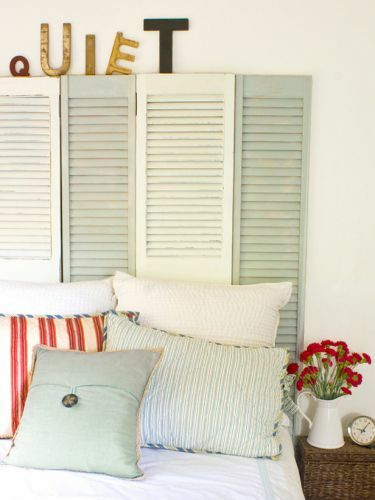 Re-use some old shutters to create a stunning headboard for your bed. Soft subtle colors painted on these panels reflect the colors of the room. This simple idea creates an impressive 3-D panel effect. Add some mis-matched and oversized letters above to display your own message for your room. Do you love the colors of accent pillows but hate all of them on the bed? The solution is to hang them on a rod behind your bed. Bright patterns and bold colors are the key to adding a pop of color to a room and this headboard idea lets you enjoy displaying these wonders of colors without the hassle of all of the bulk on your bed. This headboard idea will keep the pillows off the bed while keeping the color in the room. 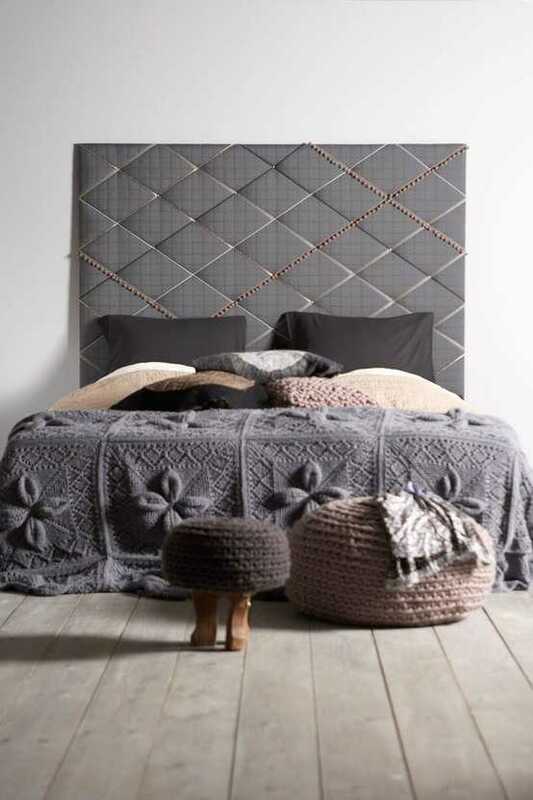 This unique headboard is a fashion lover or garment makers dream. Matching the colors of the bolt material with the patterned colors on the paneled headboard ties the entire look together. This industrious idea is both original and dramatic. The finished panels directly contrast against the unused bolts of material on the headboard creating a great visual interest to the piece. This diy headboard gives the room a clean and soft feel. 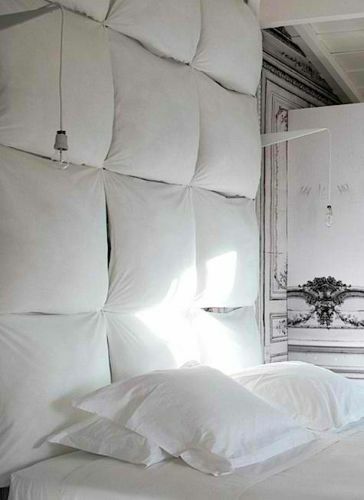 Create this headboard with a collection of pillows simply attached to the wall to create this dramatic effect. This application is successful with a variety of different monochomatic applications. Simple and easy, this treatment makes a soft statement in a loud way. Do you like to read before you retire for the evening? 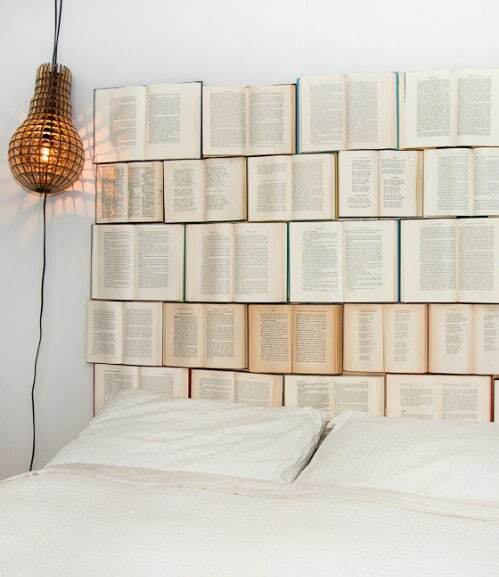 This diy headboard made from a collection of open books is an original and artistic way to display your love of the written word. Artfully displayed, this collection of reading material gives the headboard a 3-D effect and it gives the room a "scholarly" look and feel. Add to the whimsy of your child's room with one of these pool noodle headboards. Inexpensive and easy to construct, this headboard is both colorful and safe. Little ones will love the look and the soft feel of this simple diy headboard idea. No more bumps on the head for the monkeys jumping on the bed! 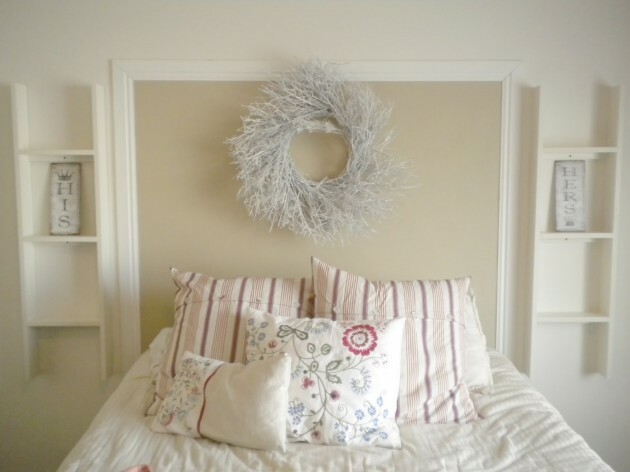 Creating your very own diy headboard can be quick, easy, and inexpensive. Use your imagination to create your very own personalized piece that will feature your passion and style. Choose from one of these styles or dream up a design of your own to create the headboard of your bed's dreams.